Step 1 Heat oven to 180C/160C fan and line a 12-hole muffin tin with paper cases. Tip the quinoa and apricots into a small pan with 300ml water, bring to the boil, then turn the heat right down, cover and simmer for 20 mins until the water has been absorbed and the quinoa is cooked. Check frequently that it doesn’t boil dry. Step 2 Meanwhile, beat the quark with the eggs, extract, oil, apples, and orange zest and juice. Stir in the cooled quinoa mixture, then fold in the pumpkin seeds, flour, almond meal, chia seeds, wheatgerm and baking powder. 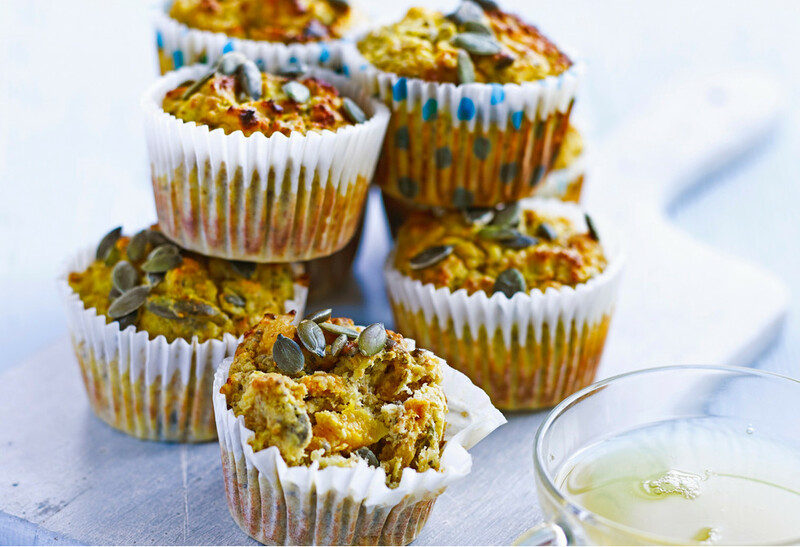 Spoon into the muffin cases, scatter with a few pumpkin seeds and bake for 20 mins. These nutrition-packed bakes are rich in healthy heart-healthy unsaturated fats. Enjoy the texture of dried fruit, seeds and cream cheese.